Earlier this month, I attended New York Winter Con and I met Sabrina, who was working the Horror Show Jack booth, where one can go for customized fangs. You can see her sporting them on her instagram @alienqueenofdarkness. "And if I seem a little strange well that's because I am" are lyrics from the Smiths song "Unloveable." Be sure to check out Horror Show Jack for your customized fangs here! Thanks to Sabrina for sharing her cool tattoos with us here on Tattoosday! Earlier this month, I attended New York Winter Con out at Resorts World in Queens. 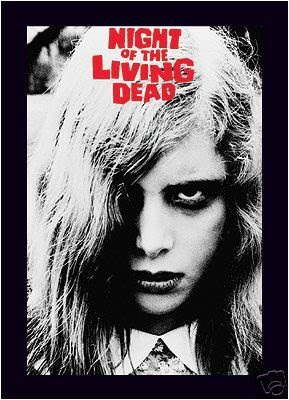 CJ explained that this is an image from the horror film Night of the Living Dead, the 1968 horror classic by George Romero. 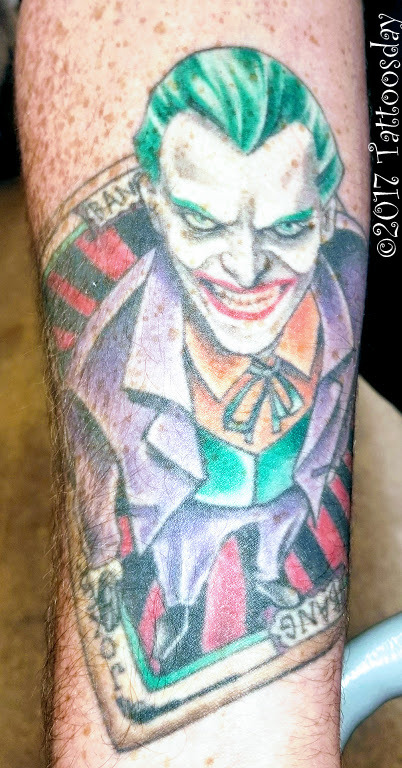 CJ loves the movie, so the tattoo taps into his nostalgia. 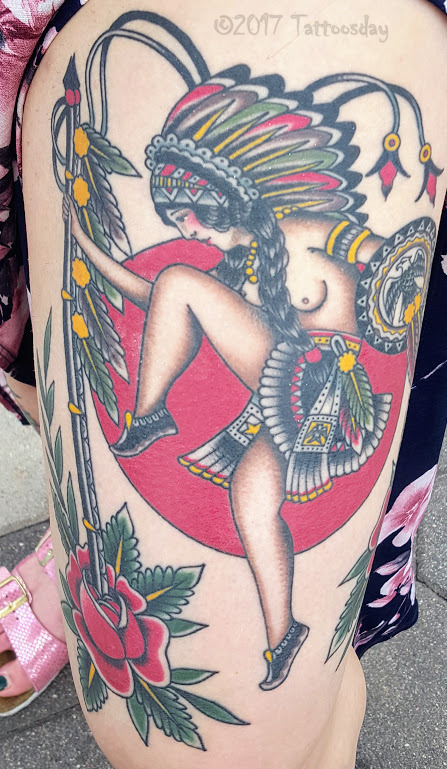 The work was done by Rebecca Fiduccia (@fire_flew) from No Ka Oi Tiki Tattoo (@nokaoitikitattoo) in Philadelphia. Incidentally, CJ plays guitar for a band called Behind the Facade (@behindthefacadeband). Check them out here. 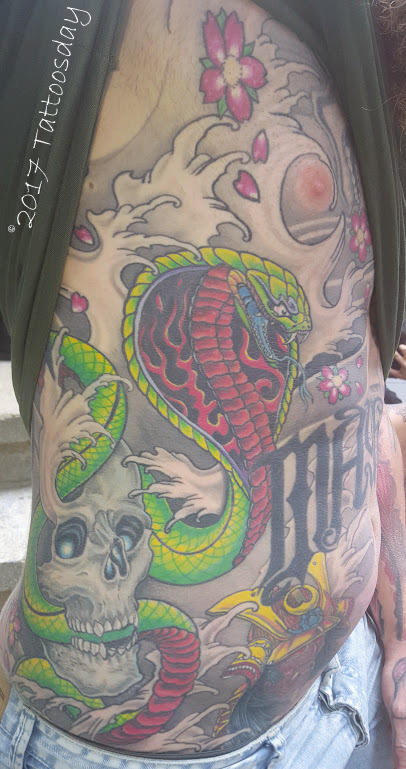 Thanks to CJ for sharing his cool tattoo with us here on Tattoosday! 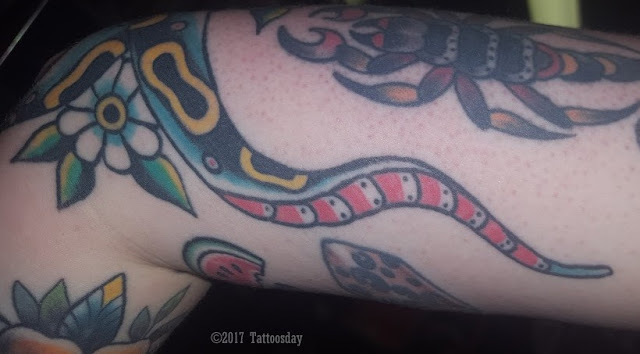 Kaitlin told me the snake was hand-drawn and tattooed by Andy Perez (@andyjperez) at Allied Tattoo (@allied_tattoo) in Bushwick, Brooklyn. 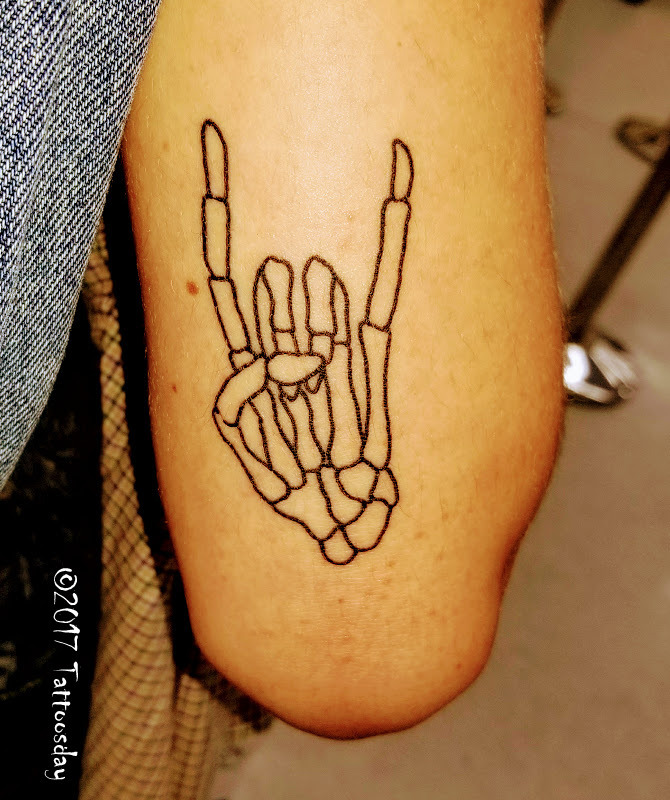 The other pieces were done by Kristin Close (@kristenclosetattoos) at Authentic Tattoo Company (@authentictattoocompany) in Raleigh, North Carolina. 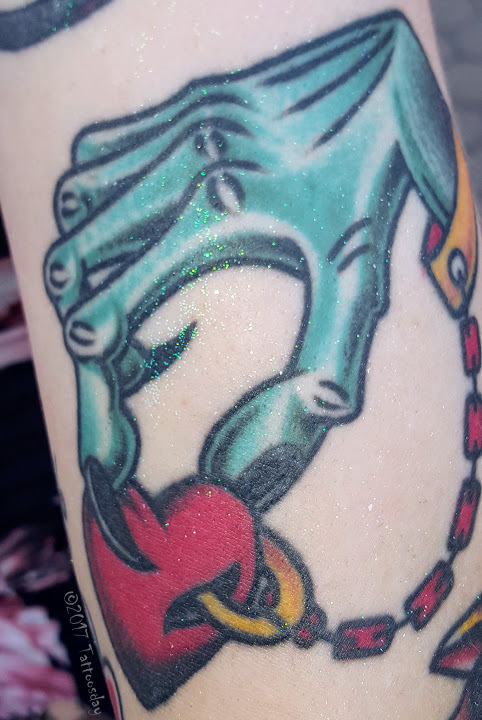 Thanks to Kaitlin for sharing her amazing tattoos with us here on Tattoosday! Back in September, I met a couple on the steps of Federal Hall in lower Manhattan. 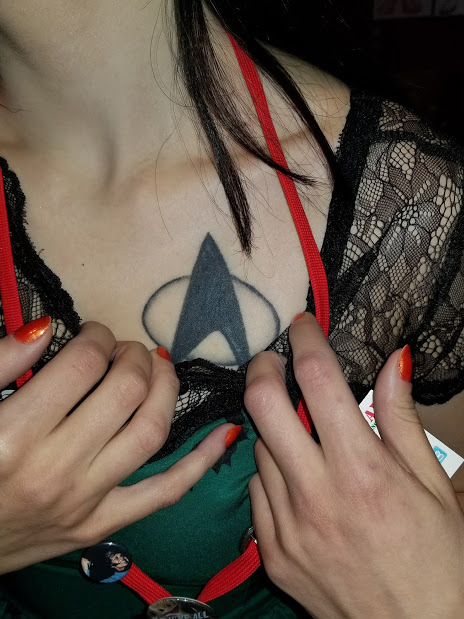 They were visiting from Belgium and, between them, had quite a few tattoos. Kenny and Ineke were kind enough to share their work. 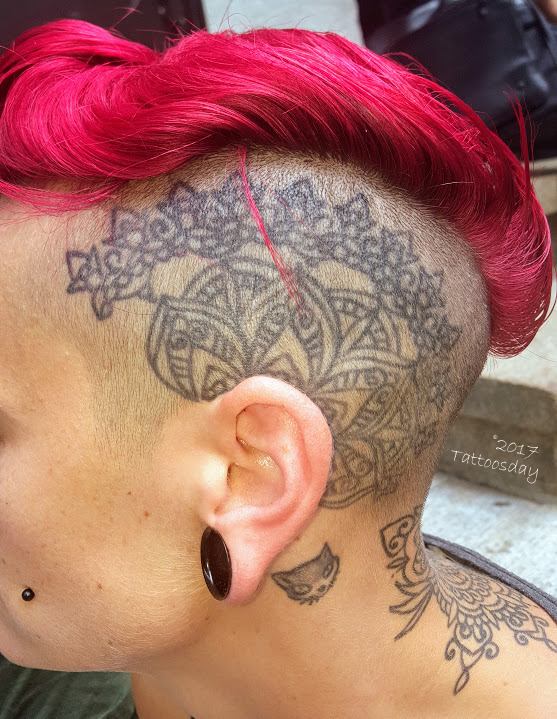 Ineke credited the patterns on her scalp to Erik El Santo (@erik_el_santo) at Dagger Moon Tattoo (@daggermoontattoo) in Hasselt, Belgium. The skull and cobra were done by Don Porto (@tattoodonporto), from Inkhouse in Geel, Belgium. Thanks to Kenny and Ineke for sharing their amazing tattoos with us here on Tattoosday! 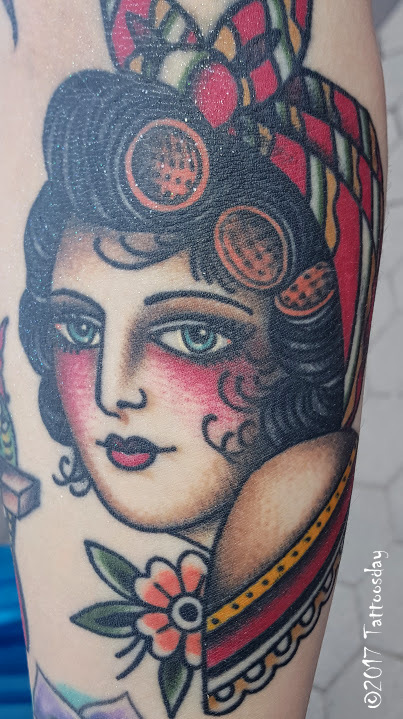 She credited the work to Jay at Portsmouth Ink in Portsmouth, UK. 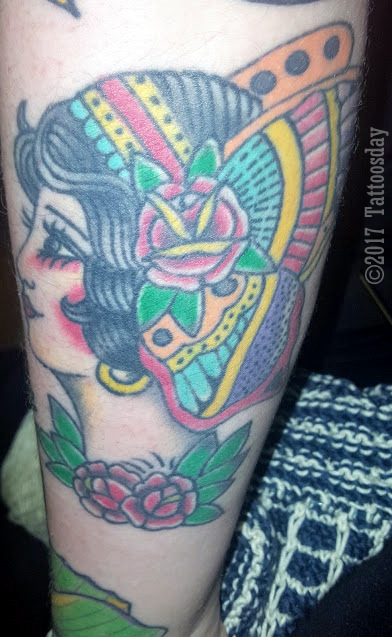 Thanks to Blossom for sharing her lovely foot tattoo with us here on Tattoosday! Turns out, Amber is a make-up artist. Check out her Instagram @amberblanchardmua. 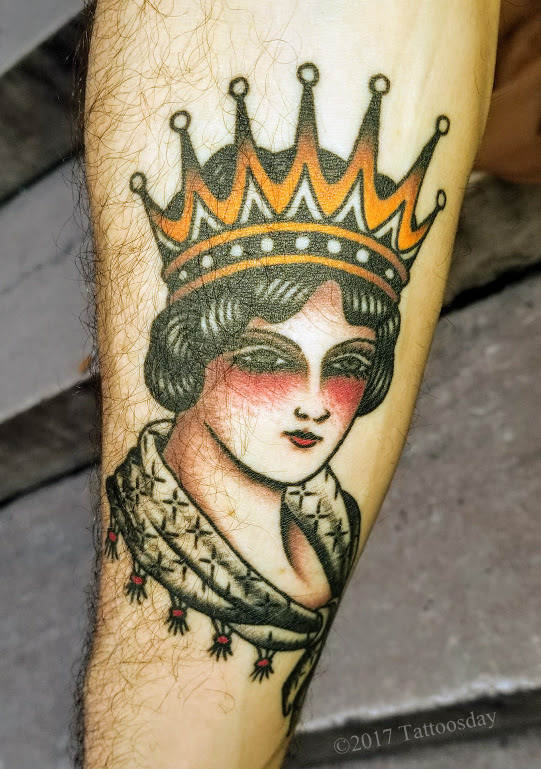 She credited her work to Ben Towers (@bentowers_tattoo) at Bella Arte Tattoo (@bellaartetattoo) in Fairfield, New Jersey. I love tattoos with tattoos! That takes an extra level of skill to pull off successfully. 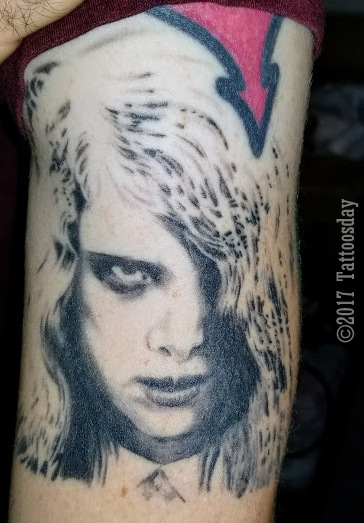 Rebekah credits the super-talented Sue Jeiven (@sweetsuetattoo) from East River Tattoo (@eastrivertattoo) with the work here. Rebekah designed and sketched it and Sue "improved and put her artistic spin" on the drawing. She told me that the piece depicts her and her partner on a bridge, which one crosses to "find your truer self." They are symbolically crossing the bridge together and he is sporting antlers because the deer is his spirit animal. 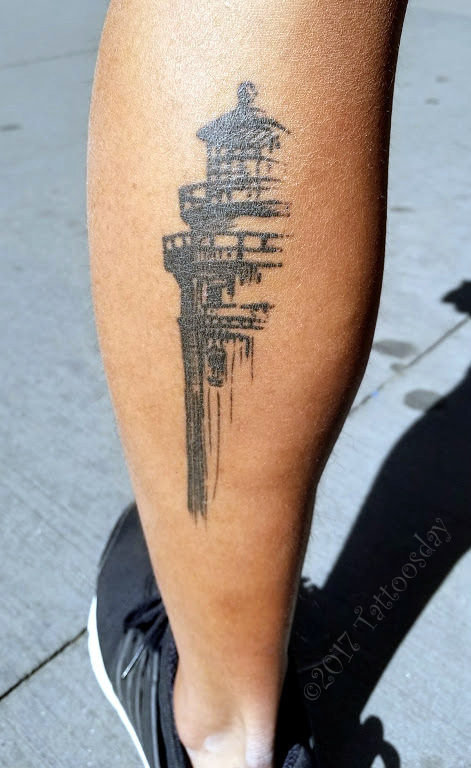 Thanks to Rebekah for sharing this cool tattoo with us here on Tattoosday! 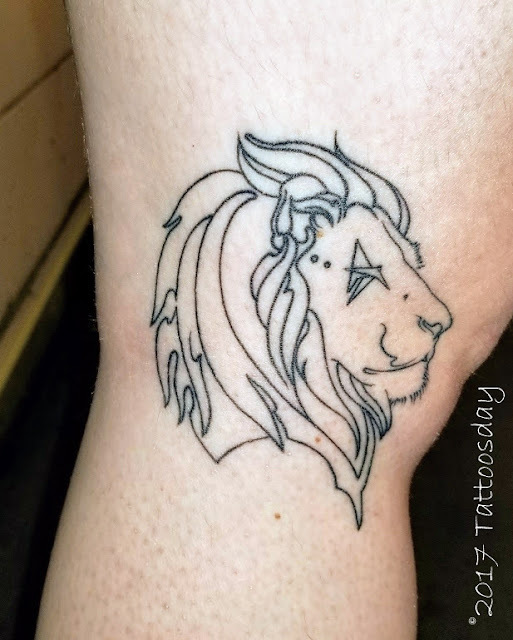 This lion is on the side of the leg of Vanessa, in a spot where you don't normally see a tattoo. 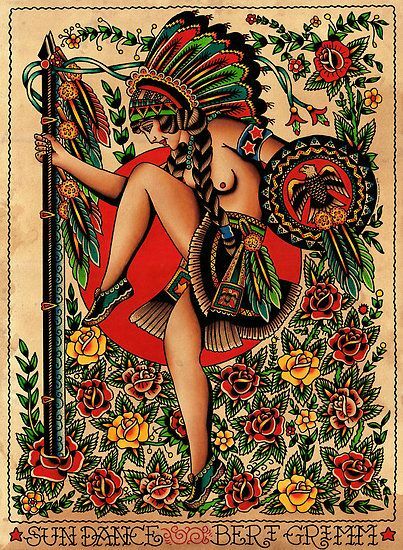 She told me that this was tattooed by Oba (@omoori) at Push Tattoo Studio (@pushtattoos) in Wilmington, Delaware. 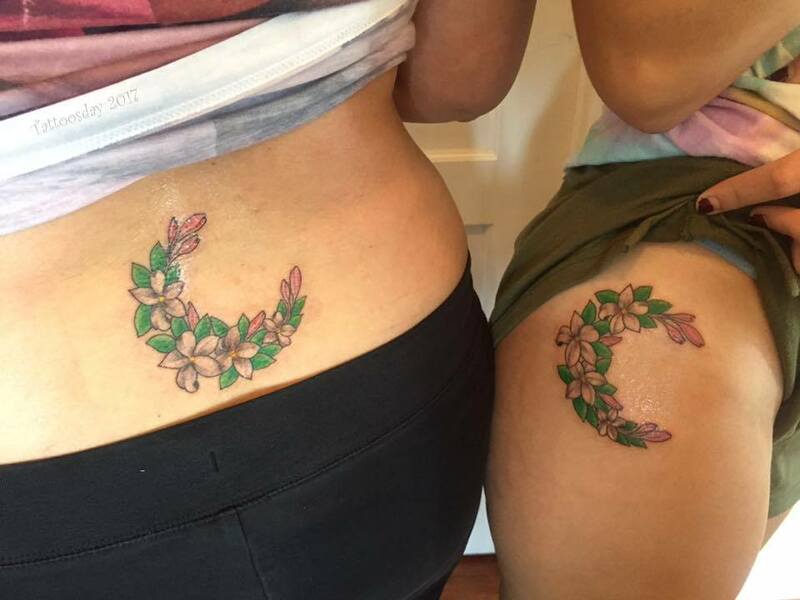 Vanessa explained that this was part of a set of matching tattoos she got with her best friend. As she tells it, the lion matched her friend's personality, and this leonine friend designed the art. I asked Vanessa what her friend got. She explained that her nickname was Goldfish, so that's what her friend got to compliment her lion. Thanks to Vanessa for sharing her cool tattoo with us here on Tattoosday! Ben told me he got this cool lion tattoo in Bang Saen, Thailand. 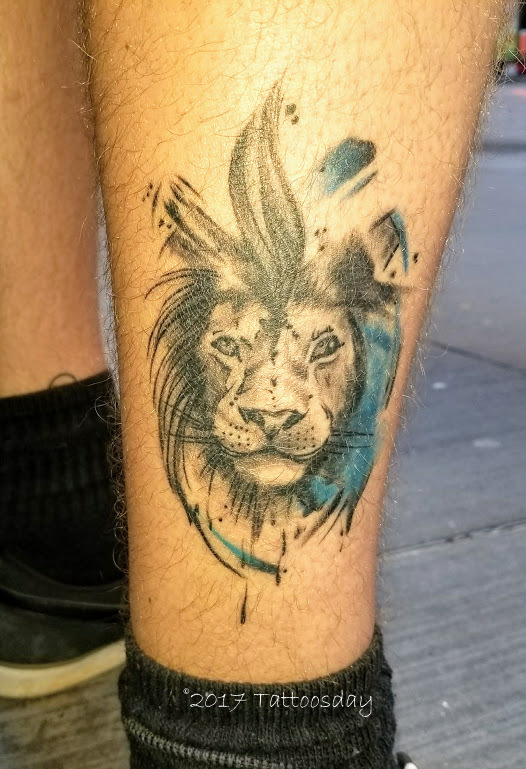 Thanks to Ben for sharing his awesome lion tattoo with us here on Tattoosday! Back in June, I met a couple from Great Britain on the steps of Federal Hall in lower Manhattan. There names were Jess and Josh, and they both were kind enough to share some of their tattoos with us. Jess credited this to Marie Cox (@lady_fts) at Folklore Tattoo Studio (@fts_tattoo) in Tamworth, Staffordshire, which is near Birmingham, England. This work was also done at Folklore, but by Adam McDermott (@admcde). Thanks to Jess and Josh for sharing their tattoos with us here on Tattoosday! Wes told me that he got this for his 18-month old daughter, Audrey. As a father of girls myself, I can relate to the sentiment that a daughter is like a queen in the realm. He credited this excellent work to Zach Nelligan (@zachnelligan) from Mainstay Tattoo (@mainstaytattoo) in Austin, Texas. Thanks to Wes for sharing this awesome tattoo with us here on Tattoosday! 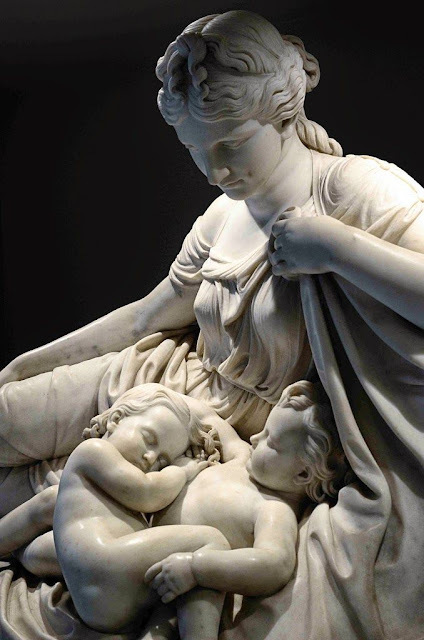 The work in question, Latona and Her Children, Apollo and Diana is a work by American sculptor William Henry Rinehart, and features a mother looking down lovingly on her two children. 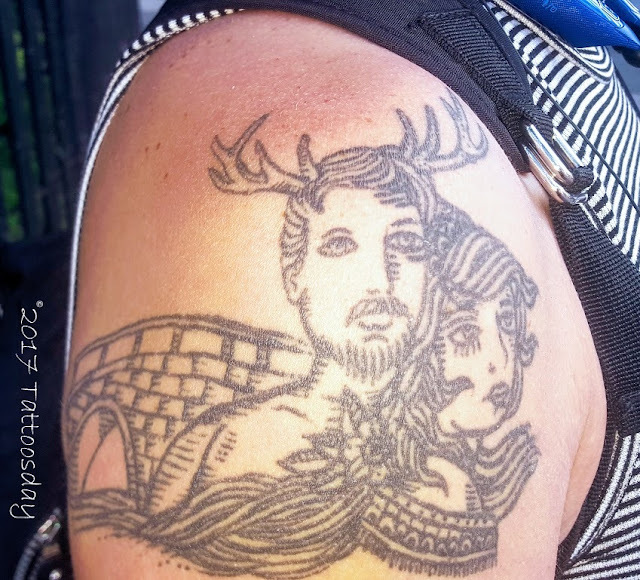 The work spoke to Jennifer, who was inspired to use this as a basis for her tattoo that reminds her of her own love of her two sons. This artwork was translated into a tattoo by Ronen Bichado (@ronentat) from Inkstop Tattoo (@inkstoptattoonyc) in Manhattan. 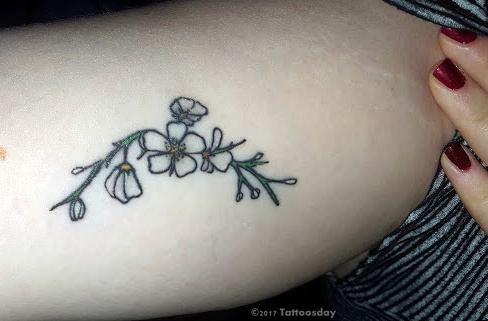 Thanks to Jennifer for sharing her beautiful tattoo with us here on Tattoosday! Back in September, I met Oscar at the local coffee shop in the lobby of my building at 30 Broad Street in lower Manhattan. Oscar told me that this is a portrait of Manuel Gregorio Tavárez, who is considered the "father of classical Puerto Rican dance." This was tattooed by Gian Karle (@giancarle) from 1711 Tattoo Studio (@1711tattoostudio) in San Juan, Puerto Rico. People may recognize Gian Karle as one of the finalists from Ink Master's 8th season (@spikeinkmaster). Thanks to Oscar for sharing his awesome tattoo with us here on Tattoosday! "I really wanted to remind myself – to have a permanent reminder readily in view – to be present, to be grateful, to be living in the moment. These are things that I regularly do anyway, but I’ve ended up in a number of quite challenging circumstances recently and was VERY depressed and really losing perspective...and it just came to me one afternoon that having this on me, in that type of font, right in the place where my pulse is taken, would be the perfect thing. Also, I had it done right before the Spring Equinox – I wanted to start new, like spring, like growth, like hope, like guess what everything comes back around and it’s all there even when you can’t see it, like seeds buried beneath the snow and the frozen ground... everything is not dead, there’s still hope, and time is fleeting and you better effing rise up and live again." 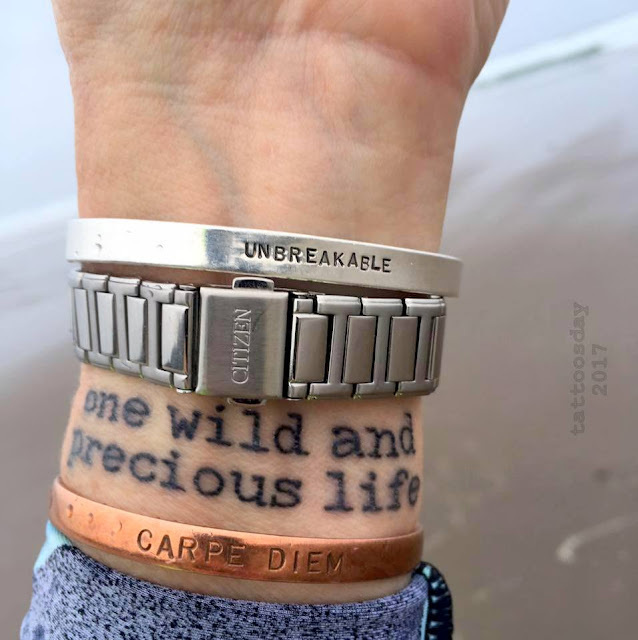 The font used is Courier and the words were inked by Berger (@tattooingbyberger) at Artful Dodger Tattoo and Comics (@adtcseattle) in Seattle. 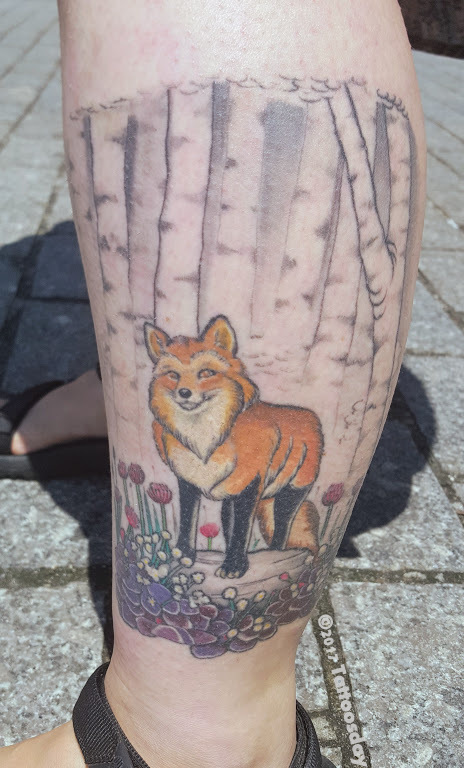 Thanks to Helen for sharing her awesome literary tattoo with us here on Tattoosday! I met Michael at a deli down near the New York Stock Exchange at the beginning of the summer. He wanted a space theme on his arm and this is the first part of it. 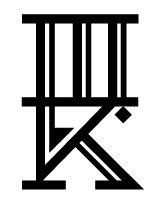 He says it will merge with a time theme on his other arm. 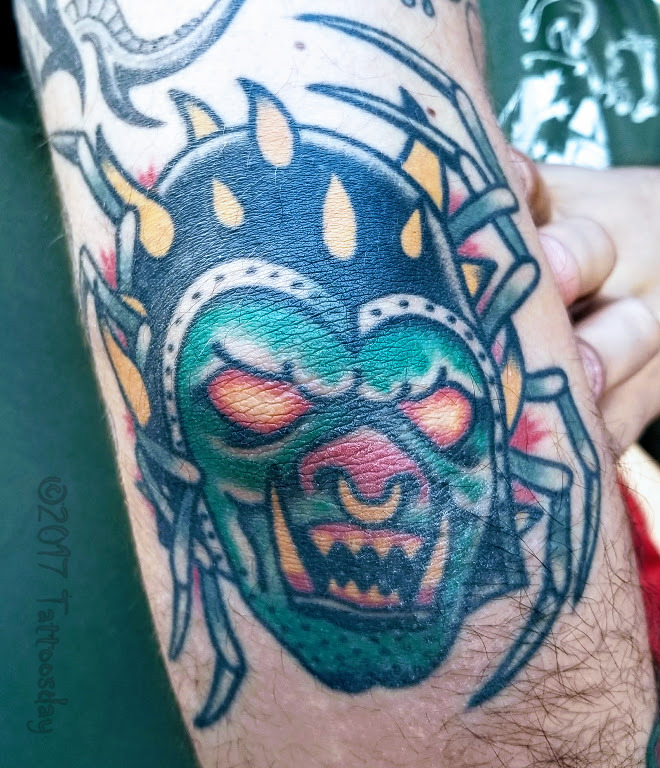 He credits this great work to Jon Mesa (@jonmesa) at No Idols Tattoo (@noidolsnyc) in Manhattan. 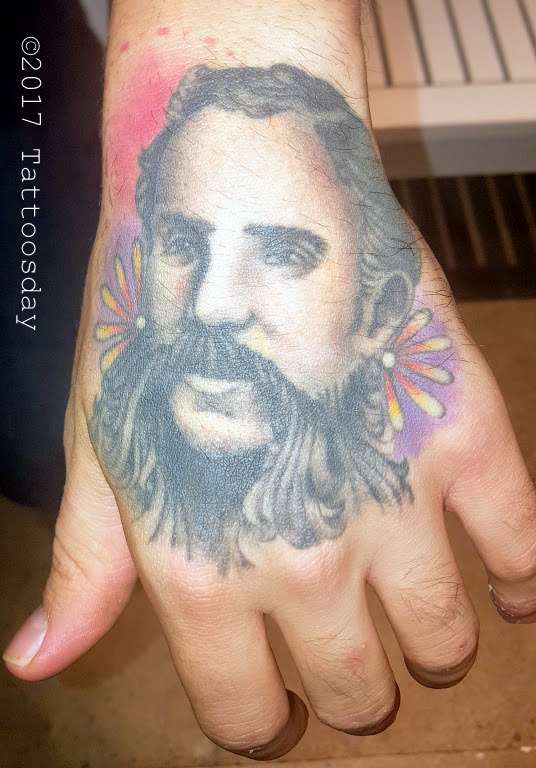 Thanks to Michael for sharing this cool tattoo with us here on Tattoosday! 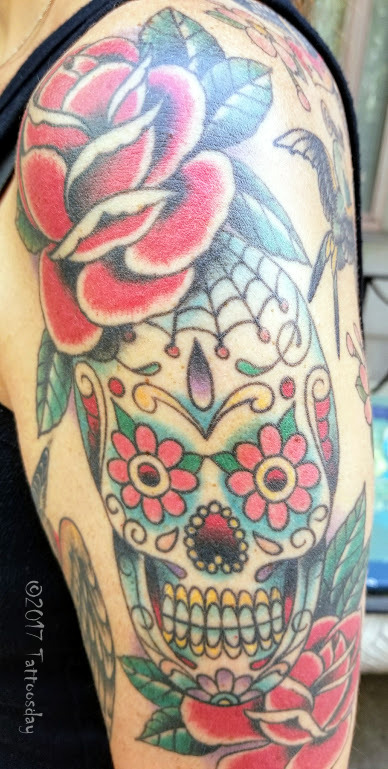 The annual Día de Muertos, or Day of the Dead, holiday has begun and what better way to mark the occasion on Tattoosday than with a sugar skull? This beauty belongs to Alyssa, who I met near Bowling Green in lower Manhattan back in September. Alyssa told me she got this tattoo to mark the ten-year anniversary of her mother's passing. The tattoo was done by Eddy Ospina (@eddyospina) at the former Wooster Street Social Club. 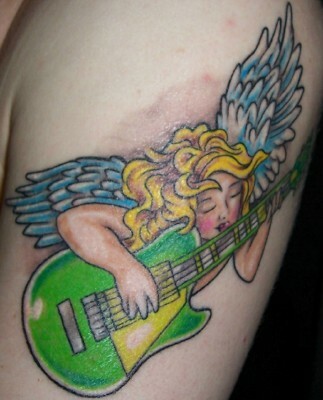 Eddy is currently calling Scharf & Sons Tattoo home, in Merrick, Long Island. 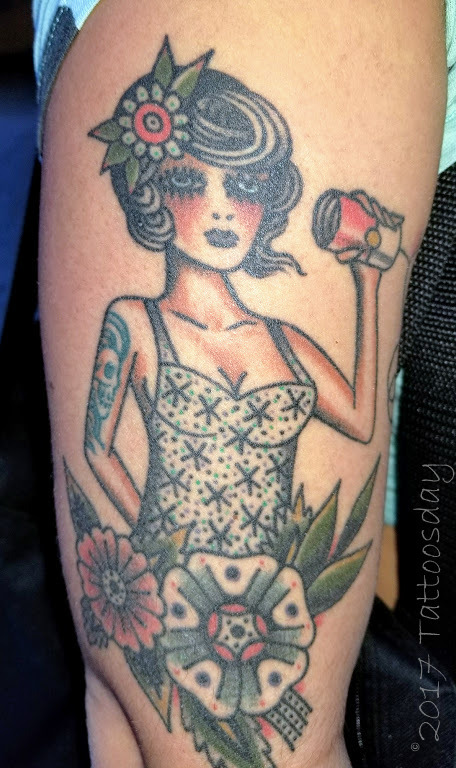 Thanks to Alyssa for sharing her awesome sugar skull with us here on Tattoosday!